Scroggin is a must have for anyone on the go who needs a little pick me up. 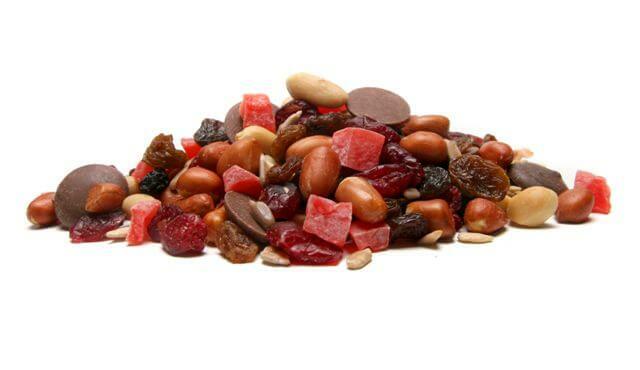 Roasted Peanuts (Peanuts, Sunflower Oil, Salt), Compound Choc Buttons (Sugar, Vegetable Fat (Contains Emulsifiers (492, Soy Lecithin), Food Acid (330)), Whole Milk Powder, Skim Milk Powder, Cocoa Powder, Flavour), Sultanas (Sultanas, Canola Oil), Sunflower Seeds, Dried Cranberries (Cranberries (65%), Sugar, Sunflower Oil), Dried Papaya (Papaya, Sugar, Food Acid (330), Preservative (220), Colour (129)). Contains peanuts, milk, soy and sulphites. May contain traces of egg, gluten, sesame seeds and tree nuts.